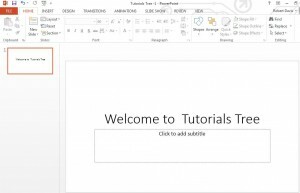 Simple Text Animations in PowerPoint 2013 | Tutorials Tree: Learn Photoshop, Excel, Word, Powerpoint and Wordpress for free online. 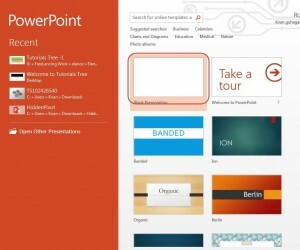 Simple Text Animations in PowerPoint 2013 – Animations can make look the dullest PowerPoint presentation exciting. 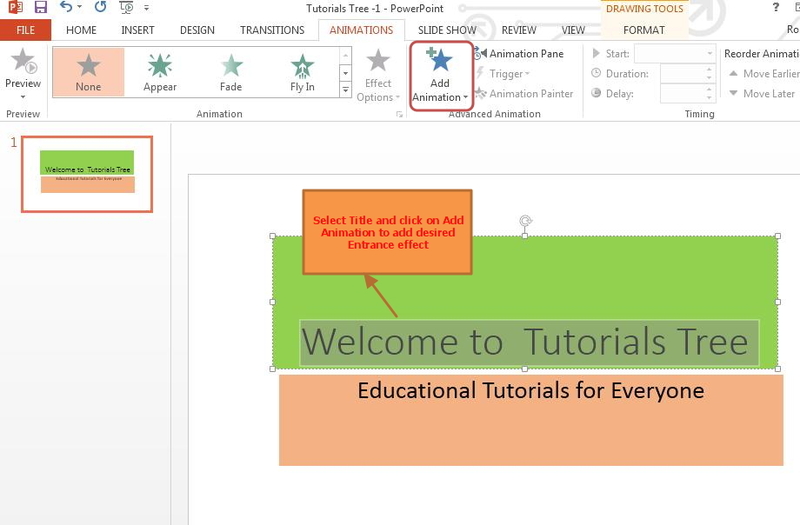 Even simple text animations can do the trick and attract attention of the audience. Try to keep things simple, as overdoing it will only distract people which means they will not be attentive towards what you are saying. 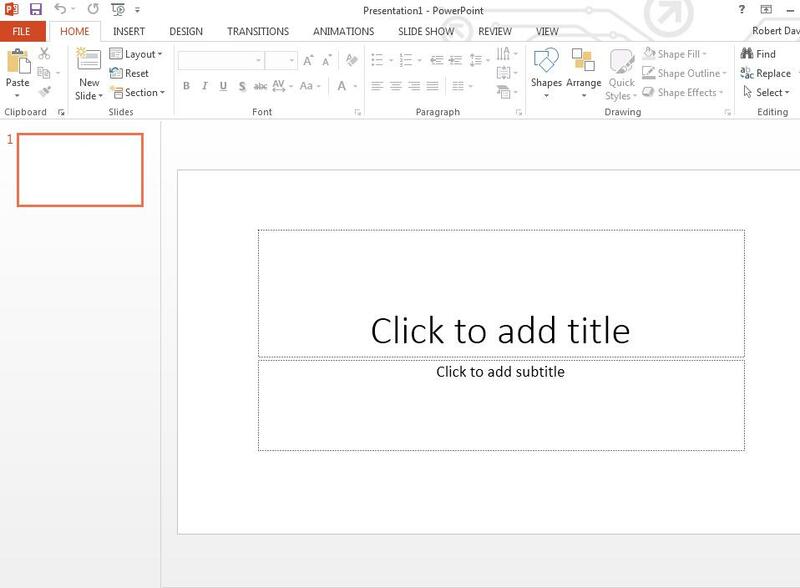 Let’s learn how to add simple text animations in your PowerPoint presentation. 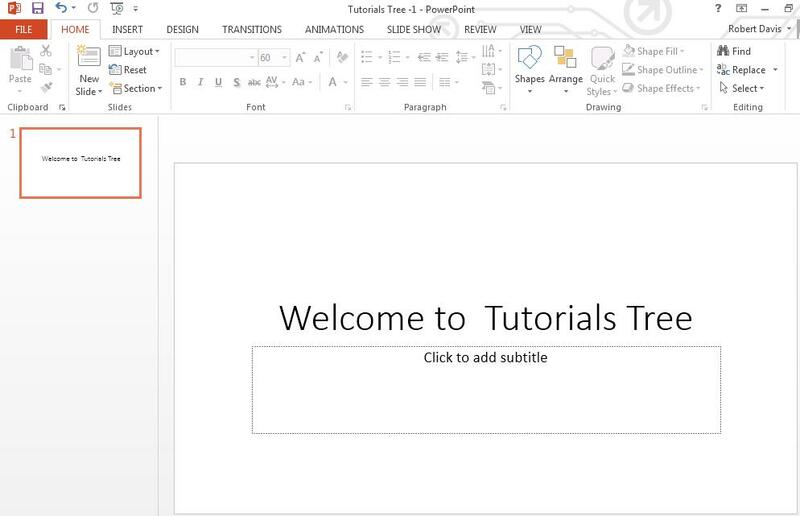 Entrance effect: It defines how object/text you want to animate enters the slide. 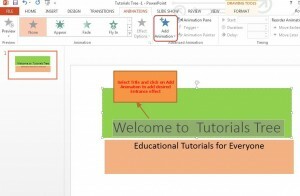 If you do not specify entrance effect for the object, it is displayed in its original position when the slide appears on the screen. 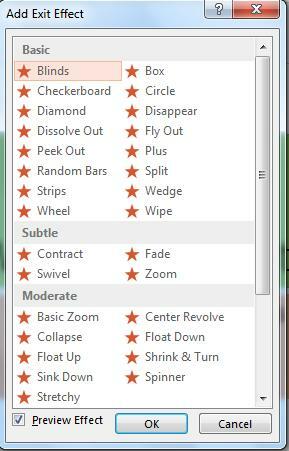 There are around 52 entrance effects in PowerPoint 2013 such as Fade, Appear, Fly-in and many more. 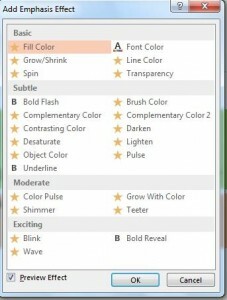 Emphasis Effect: It enables you to draw attention to object that is already placed on the slide. PowerPoint 2013 has more than 31 effects which includes Fill Color, Change Font Size, Blast Flicker, and many more. Exit Effect: it define how the object leaves the slide. PowerPoint 2013 has around 52 different exit effects. Some of them are Teardrops, Stars, springs, Spiral and so on. 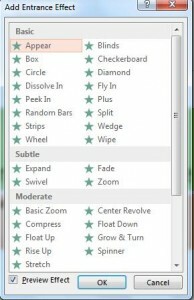 Note: For demonstration purpose, we will create one slide which will have all three basic animation effects mentioned above. 3. Click on section “Click to add title”. The Animation Pane in PowerPoint 2013 simplifies the add animation procedure. It also shows you the animations steps created for the slide in numerical order. 12. 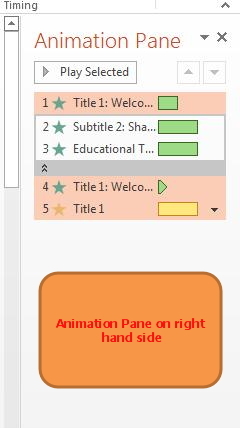 Select any desired Emphasis effect for the Title Box. 21. Click on Preview to view the text animation on the slide. 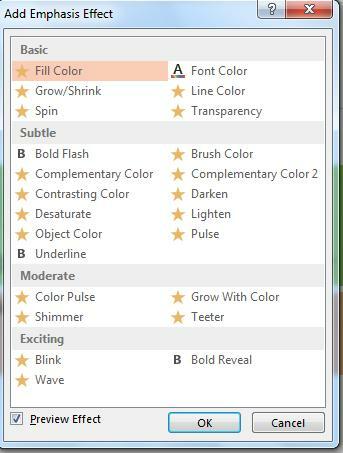 Note: The Preview will only show text animation in the selected slide. 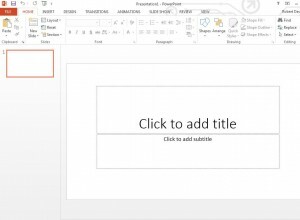 You will have to create a slideshow to see text animation in both slides in succession.